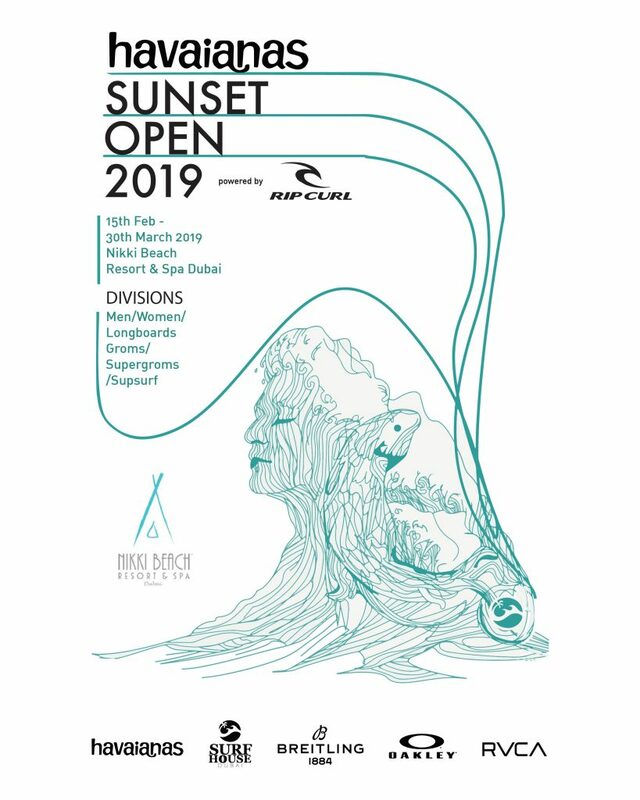 February, 2019 – One of the most anticipated events in the region’s sporting calendar, the Havaiana’s Sunset Opensurfing competition powered by Rip Curl will return to Dubai’s shores later this month, with the waiting period officially announced to be from February 15th to March 31st 2019. As the only surfing competition in the GCC, the event is now in its 7th year and will bring together some of the best surfing talent from across the region to compete for podium across six divisions. Organized by Surf House Dubai and sponsored by Havaianas, this year, the event will be held at Nikki Beach Resort & Spa Dubai. This year Surf House Dubai has teamed up with luxury Swiss watch brand Breitling, to give the winners of the male and longboard categories a brand-new Superocean Héritage II Chronograph 44 Outerknown watch. This new timepiece was created in collaboration with Outerknown, a leading sustainable clothing company that was co-founded by surfing icon Kelly Slater. Like Breitling, Kelly Slater works with Ocean Conservancy to raise aware­ness of the problem of marine waste and to help motivate individuals to take action to clean up the oceans. “Surf competitions rely on the whims of nature; therefore, the two-day event will run across the best consecutive Friday and Saturday of waves within this 5-week waiting period. It’s one of the most exciting times of the year for Dubai’s existing surfing community – we have a surprisingly strong surf history here and we’re proud of the talent in the region. It’s also a great opportunity for newcomers and others interested in experiencing Dubai’s vibrant surf community, whether it’s to take part in the event or simply to enjoy the atmosphere and activities. Nikki Beach Resort & Spa Dubai is an ideal location since the waves around the location offer some of the UAE’s most high-performance surfing conditions. The facilities will provide spectators and participants alike with plenty of ways to enjoy the occasion in comfort and style,” says Scott Chambers, Managing Director and Founder of Surf House Dubai. The event will also feature a number of other attractions, including beach yoga, strength and fitness training workshops, kids activities, as well as a food and beverage selection from Nikki Beach Resort & Spa Dubai, a retail selection from Surf House Dubai, Rip Curl, Oakley, RVC, live music and more. To keep abreast of the announcements for the competition dates within the waiting period participants are encouraged to follow Surf House Dubai’s social media accounts (@SurfHouseDubai on Instagram, and “Surf House Dubai – Surf and SUP School” on Facebook) for regular updates, announcements, and more.